We are passionate about helping our community. 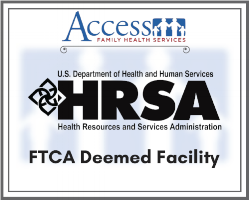 Access Family Health will provide free education & assistance to our patients and the public. Call ahead to verify availability. To reiterate our commitment to teamwork, we are partnered with other health care providers and local organizations in the surrounding communities.